When he got a single in the second inning of Wednesday's game, it was easy to spot the throng of Benintendi supporters writes CSNNE.com's Sean McAdam. McAdam reports the crew was 18+ deep and his father, Chris, claimed that he was far more nervous for Andrew's college and high school games than seeing him as a professional for the first time. Tim Britton of the Providence Journal says that Benintendi has impressed in his limited time in the majors, and even quotes manager John Farrell as saying, "He's got a beautiful swing. That's evident by the way he approaches each at-bat." He goes on to say that he is not far from having the training wheels taken off and seeing everyday action. It seems it is never too early to predict what a player will be. That seems to be the case for Benintendi less than 200 major and minor league games into his career. Chris Mitchell at FanGraphs runs him through his "KATOH model" and it predicts big things for the 22-year-old. It has a very nice list of comparable players, and also says that he has a greater than 50% chance of having 16+ WAR over his first six seasons and a 30% chance of 20+. Not too shabby. SoxProspects.com and FanGraphs were not the only ones to look into what can be expected from Benintendi during his call up. Every publication and industry expert seemed to want to weigh in on the subject. MLB.com's Jim Callis says he should surpass the weak production the Red Sox have gotten from left fielders right away with more to come as he develops. Baseball Prospectus' Christopher Crawford was more direct in his praise of Benintendi and his immediate impact potential saying, "There are four plus tools here, and Benintendi is such a smart player with quality instincts that it’s really tough to see him not being an impact player immediately. 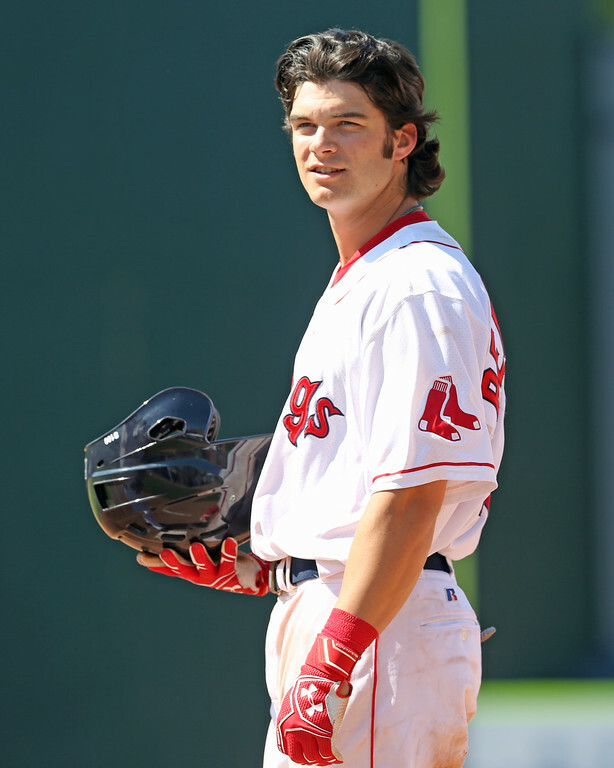 Baseball is really hard, but Benintendi makes it looks easy." Also not short on praise, Baseball America's JJ Cooper calls him "one of the best hitting prospects in the game," and says his impact should be similar to that of veteran pitching acquisition Drew Pomeranz. Benintendi was not the only prospect to be promoted this week, as Executive Editor Chris Hatfield confirmed that right-handed relievers Jeffry Fernandez and Jake Cosart will move up to High-A Salem from Greenville, and 2016 fifth-round pick Steve Nogosek will move to Greenville from Lowell. Dunne covered the moves last week and provides some more details on the players involved. Baseball America released their High Class A Best Tools list this week, and Red Sox were all over the Carolina League portion. Top prospect Yoan Moncada alone landed in four spots on the list (most exciting player, best hitter, best baserunner, and best defensive second baseman). 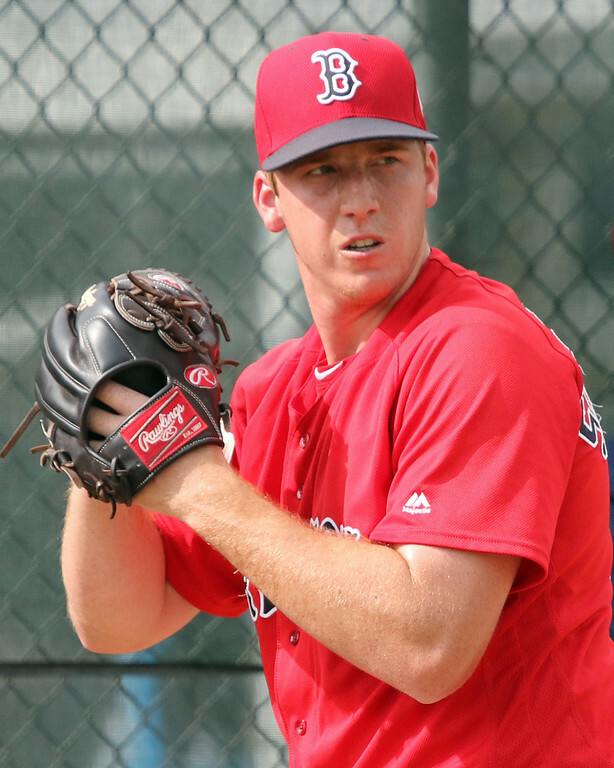 Righty Michael Kopech also was given the best fastball, Nick Longhi (pictured, left) was tabbed as the best defensive first baseman, and Rafael Devers as best defensive third baseman. With catchers Ryan Hannigan landing on the DL, Blake Swihart needing a second opinion on his setback in his recovery, and Christian Vazquez hitting only .243/.296/.338 since his demotion, the Red Sox hole at catcher was obvious. They must have felt extremely lucky when Bryan Holaday was placed on waivers by the Texas Rangers and were able to claim him, as Anthony Witrado writes for ESPN Boston. Red Sox fans should not expect him to be a huge difference maker (he has hit .238/.290/.405 thus far this year and .246/.284/.353 career line), but he should prove to be a capable backup for a very needy team. Just as talk was starting to ramp up about when infielder and top prospect Moncada would be promoted, the injury bug jumped up and bit him. Britton notes that the ankle sprain he likely sustained sliding into third base during a steal on Friday is very mild and will likely only cause him to miss a week or so. You might think seeing his teammate promoted right to the majors would make Moncada anxious to join him. 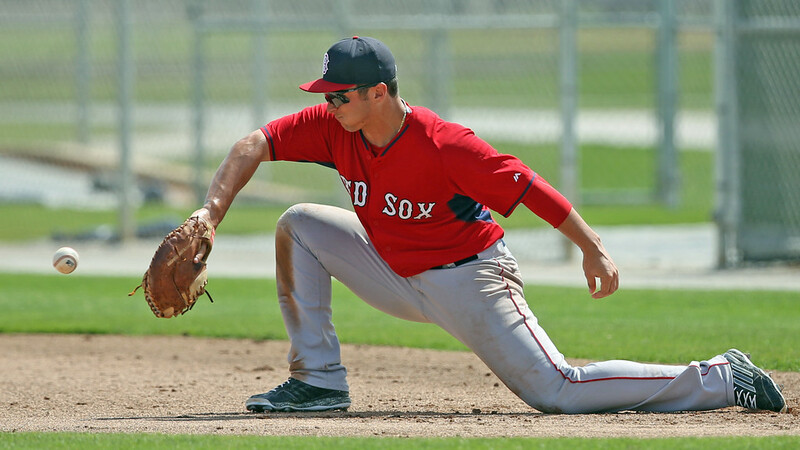 WEEI's Rob Bradford spoke with Moncada who said he is not in a rush for anything. Earlier this season the Red Sox gave lefty Brian Johnson time off to seek treatment to help with the anxiety he had been dealing with. He has since returned to the organization and worked his way back up to Triple-A. The Providence Journal's Brian MacPherson writes that Johnson is no longer debilitated by anxiety. Kopech led off this past week's Tuesday's Top Prospects on MLB.com after throwing six shutout innings with 10 strikeouts. Kopech had a second start this week as well that, while not as strong, was still very good. He went five innings with one unearned run with seven strikeouts on three hits, but walked four. Overall on the year, Kopech has thrown 37 2/3 innings with a 0.96 ERA, 1.22 WHIP, 53 strikeouts and 24 walks. The Red Sox sent their top pitching prospect, Anderson Espinoza, to the San Diego Padres in July in exchange for the left-handed Pomeranz, and ESPN's Buster Olney has reported that the Padres have come under scrutiny for allegedly not disclosing the full medical information of their players involved in their recent trades. The Marlins were one of the other trade partners, and the player they received already needs Tommy John surgery, which has resulted in a reversal of that portion of the trade. The Red Sox are not seeking any alterations to their deal at this time according to Olney. Linked to all sorts of players from Chris Sale to Jonathan Lucroy, there was a lot of speculation at the trading deadline of whether the Red Sox would try and pull off a blockbuster trade, and, if so, which elite young players they would include in such a deal. MLB.com's Ian Brown spoke with Red Sox President Dave Dombrowski about the deadline and if they were reluctant to part with Moncada or Benintendi. His answer was definitive: "I would say extremely," said Dombrowski. "They're really good. And they're not the only ones. [Rafael] Devers you could say is pretty close, too. He's a little younger. These guys are special players, and they're not far from the big leagues, either." Consistency kills and Tavarez dominated with the bat consistently throughout the week. He had a hit in every game except for Tuesday and had multiple hits in four of the six games this past week. He saved his best performances for the end of the week. Friday he went 3 for 4 with a double, Saturday he went 2 for 5 with a triple, and he capped it off with a 3 for 4 effort with two home runs on Sunday. Midway through the season in late June, Tavarez was briefly called up to Triple-A for five games. Since his return on July 1st, Tavarez has been crushing the ball. Over 29 games, he has hit .373/.397/.609 with five doubles, six triples, and three home runs. That hot streak has raised his overall season slash line to .330/.375/.498 over 322 plate appearances. The only way you have a better start than Staniewicz (pictured, right) had last week is if you throw a perfect game. His only blemish on Tuesday was a sixth-inning, one out single to center field he allowed to Erie's eight-hole hitter, Grayson Greiner. He got two fly ball outs to end that inning, and then did not allow another baserunner the rest of the way. The performance was strong enough to also earn him Pitcher of the Week in the Eastern League. It has been an up and down year for the 22-year-old. Prior to last week's game, he had not allowed less than two runs in almost three months, with the last time being May 20th when he went six innings while allowing two. He had not had a start where he did not allow a run since he went six shutout innings in his third start of the year on April 20th. The strong start last week lowered his season ERA to 4.81 and his WHIP to 1.36. Photo Credit: Andrew Benintendi, Nick Longhi, and Teddy Stankiewicz by Kelly O'Connor.